These are the income statements for my home performance company, Green ID. 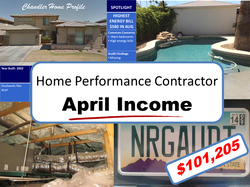 When I started my home performance business in 2009, I was my business and as a soloprenuer, do-it-yourself owner, I would have liked more guidance along the way and an income report from a home performance contractor is one of the things I would have liked to have access to. We may not be the largest home performance company out there, but we are no longer the smallest either. I hope you find these income reports useful and encouraging in your home performance journey.